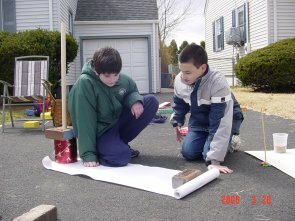 Home schoolers Alex Wisniewski (left) of Union and Tyler Huey of Nutley participated in the on-line "Noon Day Project" administered by the Center for Innovation in Engineering & Science Education (CIESE) of Stevens Institute of Technology in Hoboken. 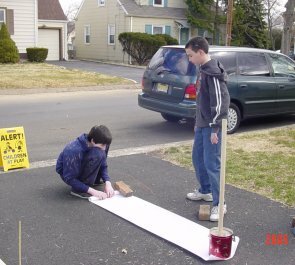 The students measured the shadow cast at noon on March 20, shared information with a school in Columbia, SA, and used mathematics to recreate what the librarian Eratosthenes did over 2,000 years ago in calculating the circumference of the earth. Their calculations resulted in a circumference of 38,580.9 km. Eratosthenes’ calculation was approximately 40,000 km.